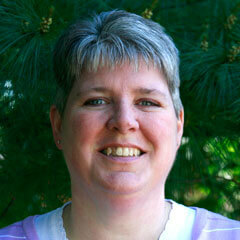 Tammy Schroeder, Minister of Programming and Communications, has been on staff since 2004. You will find her in the front office doing a variety of tasks and keeping in contact with FPC many ministries. She is a member of the Outreach Council which over sees most of the public relations and community awareness of FPC. Also, a member of the Equipping team (former Christian Education), she is actively involved in all aspects of FPC education with an emphasis on family and adults. She is married to Darin and they have 2 children, Cullen and Logan. Their house is kept active with 4 rescue dogs, a Great Dane mix named Gus, a Beagle- Libby, a Beagle mix – Hoover, and an elderly dachshund named Wilson. She enjoys knitting with the FPC knitting group, “Needles, Hook and Yarn,” reading on her Kindle, and being outside with her family.